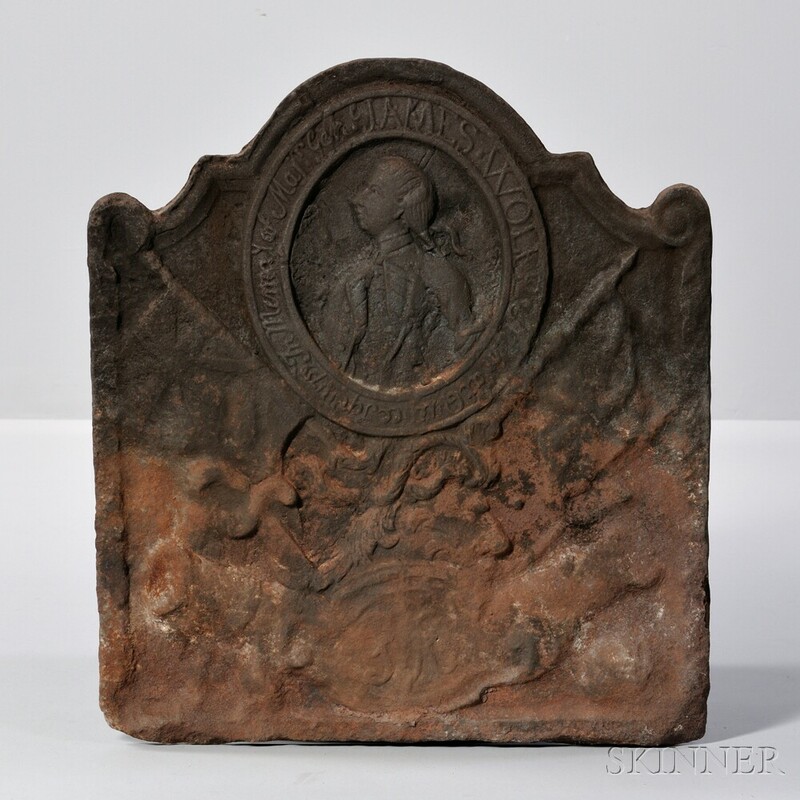 Commemorating a Fallen General in Cast Iron | Skinner Inc.
For centuries cast iron firebacks have decorated the insides of fireplaces and typically, served two primary functions. Firstly, they protected the wall at the back of a fireplace from the excessive heat of the hearth’s fire. This was particularly important in chimneys constructed of daub (a mixture of clay and straw over woven sticks or branches). The secondary function of a fireback is to radiate heat from the fireplace into the room. Like any metal, cast iron is an excellent conductor of heat. Radiant heat from large masses of metal can be felt many yards away. Known as “chimney backs” in the 18th century, these useful objects could be purchased from any number of ironmongers or retailers in America’s port cities. 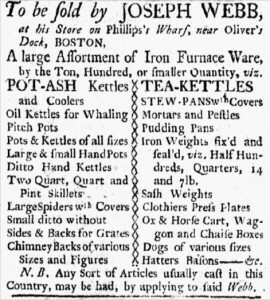 Merchants advertising in mid-18th century American newspapers often note chimney backs in their lists of “Lately Imported” goods from England. Chimney backs marked with American forge names and dates show that they were also being cast in America’s mid-Atlantic colonies as early as the 1740s. One interesting chimney back offered in Skinner’s August 14-15 Americana auction commemorates British Major General James Wolfe (Lot 34). Rectangular with a stepped and arched top, it features a bust-length portrait of the general in military dress facing to the left in an oval frame above a panoply of arms composed of crossed flags, cannon, swords and a medallion featuring a “GR” cypher. General Wolfe was second-in-command in the successful expedition to capture the French Fortress of Louisbourg in Nova Scotia in 1758. Following that success, General Wolfe was given overall command of a large British force that sailed up the Saint Lawrence River to capture Quebec City. A three-month siege through the late summer of 1759 culminated in a fifteen-minute battle on the Plains of Abraham where the British defeated the French army and captured the capitol of New France signaling the beginning of the end of the French & Indian War. During the battle the 31-year-old British commander was killed. With the capture of Quebec, the French hold on Canada was broken and General Wolfe’s success was celebrated across England and her colonies in America. Shortly after Wolfe’s death King George III commissioned British portrait painter J.S.C. Schaak to create a posthumous portrait of the General. The portrait was subsequently engraved by Richard Houston, published as a mezzotint and it soon reached America. The print featured a bust-length profile portrait of General Wolfe in military uniform wearing his hair in a long queue without a hat and framed in an oval aperture. This is the exact same image that appears on the chimney back. Two years later Webb advertises in the same newspaper “Fine Carv’d Chimney-Backs” suggesting that he then offered decorated chimney backs. 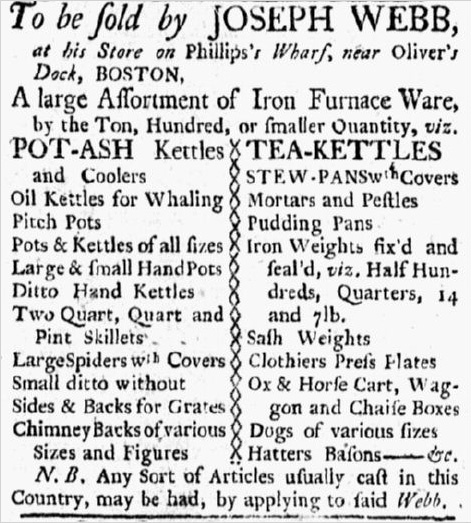 Then in June, 1764, Webb advertised in the Boston Evening-Post that he sells “Chimney Backs of various Sizes and Figures” and boasts that “Any Sort of Articles usually cast in this Country, may be had, by applying to said Webb.” Certainly Joseph Webb’s business had flourished in just a few short years! But is there any evidence that Webb produce the General Wolfe chimney backs? 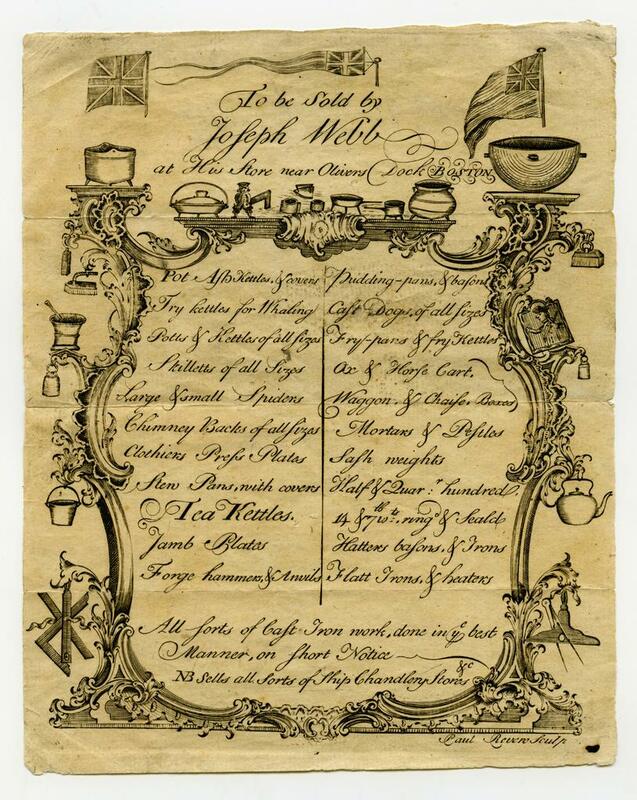 An advertising card for Joseph Webb who may have produced the Wolfe fireback. While not definitive, there does seem to be strong circumstantial evidence to suggest that he may have. 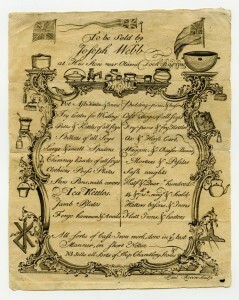 An illustrated advertising card engraved by Paul Revere, Jr. for Joseph Webb is preserved in the collection of the American Antiquarian Society. While undated, it is thought that the card was produced c. 1765. Typical of advertising cards of the period, it is decorated with a rococo frame surrounding text identifying the merchant’s goods including, in this case, “Chimney Backs of all sizes.” More significantly, however, is that along with a wide variety of cast iron goods illustrated dangling from the rococo scrollwork is, near the upper right corner, clearly a rectangular chimney back with a stepped and arched top depicting what is clearly a military figure wearing a cocked hat with outstretched arm that closely resembles another popular mezzotint image of General Wolfe also engraved by Richard Houston that was widely circulated in America in the early 1760s. While it may never be definitively known if Joseph Webb was responsible for the production of the General Wolfe chimney backs, we do know that he sold a variety of these useful objects and his advertising card appears to illustrate one decorated with an image of Wolfe. Preview the General Wolfe chimney back and all other lots offered in Skinner’s August Americana auction at their Marlborough, MA gallery on Thursday, August 11 from 12-5PM; Friday, August 12 from 12-8PM; and Saturday, August 13 from 12-5PM. This entry was posted in Blog and tagged American, Americana, antiques, artwork, auction, Cast Iron, decorative arts, federal, fireback, furniture, General James Wolfe, skinner, skinner auctions by Christopher D. Fox. Bookmark the permalink. Nice post for the wood furniture lover. I am sure people will enjoy your post for a long period of time.